Capital S.M.A.R.T held its third annual conference for the leadership teams in July. Telstra's Experience Centre in Melbourne was the venue for the more formal activities with team members able to experience the latest in technology innovation. Capital S.M.A.R.T Chief Executive, Norman Moss said the focus on innovation had been one of the drivers of Capital S.M.A.R.T's success and being able to understand the technological advances in communications and its application within our industry was inspirational for team members. "It's important for us as we focus on continuous improvement in customer service to look at what other industries and sectors are doing," Mr Moss said. Capital S.M.A.R.T has partnered with Telstra in developing its IT strategy and was featured in Telstra's 2013 "Clever Australian Campaign" in recognition of its innovation in developing the national network of Repair Centres and the emerging digital capability through its proprietary Key2Key™ system. 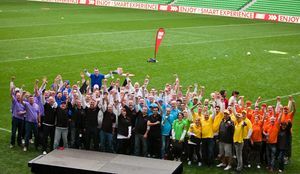 The conference also involved the 90 team members from Operations, Customer Care and National Support Office having a series of competitive team games at the AAMI stadium featuring soccer, rugby, AFL and laser target shooting games. The Fox Classic Car Collection at Docklands was the venue for the awards night dinner. The curator, Brian Tanti provided the audience with a rare and valuable insight into the history of the motor collection during dinner. The award for the Best Repair Centre Small was taken out by Nerang (QLD), Silverwater (NSW) won the Best Repair Medium Centre and Archerfield (QLD) took out the Best Repair Centre Large. Finalists in their respective categories were Hallam (VIC), Holden Hill (SA), Bentleigh East (VIC) and Seven Hills (NSW). Bentleigh East won the "Be SMART, Be SAFE" Safety award. Teams from the winning and finalist centres are rewarded with a "team day out" of their choice to celebrate their respective achievements. Site management were inducted into the 100+ Club. The "Special Nomination" Team Award for 2013 went to the Key2Key™ Project Team recognising the successful implementation of the digital platform across the national network in the year. The award brought a standing ovation from the business leaders on the night. PPG once again sponsored the Excellence Awards in Paint. The individual regional awards went to Kevin Savery from Knox (VIC), Robert Hunt from Peakhurst (NSW), Ricardo Fernandez from Northgate (QLD) and Richard Hodgson from Booragoon (WA). The Best Site Assessment Award went to Bentleigh East (VIC) and the Best Paint Team Award went to Archerfield (QLD). Capital S.M.A.R.T's 2013 National Business Award for Innovation in its industry was also announced at the conference with Norman Moss paying tribute to founder Jim Vais for his leadership in innovation and recognising the emerging capability of the proprietary digital platform.